Part diner, part family restaurant, Risser’s has been serving local favorites in western Berks County for decades. The original dining car opened in 1954 as the Blue Star Diner, and it still maintains its retro styling, with stainless steel trim on the counter and stools. The dining room has a more rustic feel, with the mural on one wall and country primitives throughout. One of the highlights of dinner at Risser’s is the soup and salad bar that comes with most meals. Six varieties of soups, from chicken noodle to clam chowder, are available on any given night. The salad bar includes more than 10 different dressings-including hot bacon dressing, homemade macaroni and potato salad, and some of the best red beet eggs anywhere. Fresh baked muffins and breads are also included. And with every salad bar order comes soft ice cream, vanilla and chocolate, with topping options that include chocolate syrup, crushed Oreo cookies, peanuts, and chocolate sprinkles. Risser’s has all the standard diner fare: french toast, pancakes, and omelets at breakfast; soups and sandwiches at lunch, and meat and potato platters at dinner. 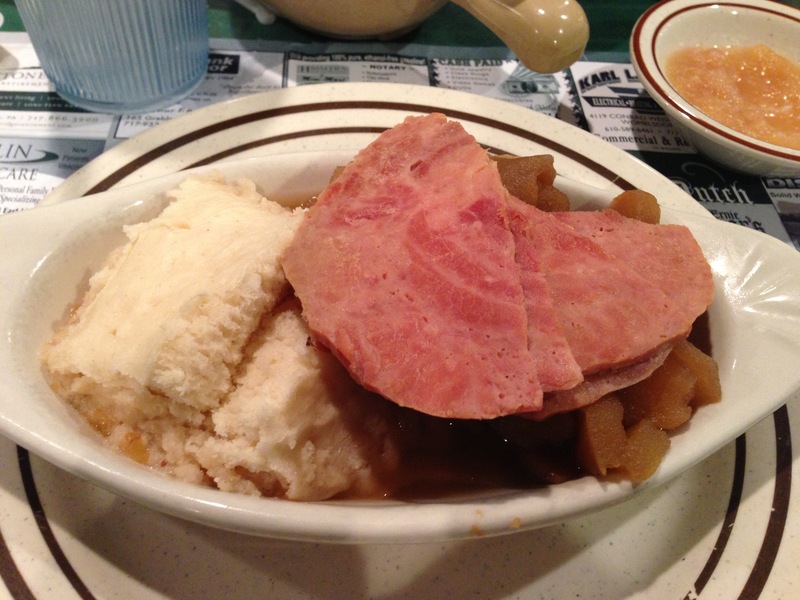 But Risser’s specialty is traditional Pennsylvania Dutch entrees: chicken pot pie, pig stomach, beef heart, and a personal favorite, schnitz und knepp – warm, baked apples served with a dumpling and four thick slices of baked ham. The flavor combination is unexpected, a mix of dinner and dessert. As the dumpling soaks up the glaze from the apples, it tastes more and more like apple pie. The saltiness of ham is a strange, but welcome addition to the dish, and it only gets better as the ingredients have time to blend together. The only downside to the dish is that it’s only offered every few weeks as a special, and is not part of the daily menu. If you’re looking for the unique taste of Pennsylvania Dutch cooking, Risser’s is a great choice. Entrees run between $10-$15, and many are available in small and large portions. Check their website or local ads for weekly and daily specials. February 10, 2013 in Diners, Reviews.